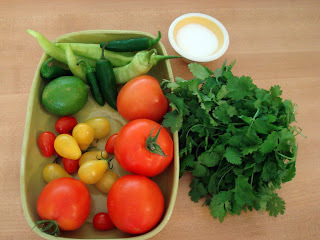 Squash House Quilts: No Recipe Salsa! Gosh if I hadn't just eaten homemade blueberry pancakes I'd be over with a spoon! Thanks for sharing. It's just now dinner time on the East coast and I haven't eaten yet. I was hungry, now I'm STARVING. Nothing better that homemade salsa! Can you say yummy! wish I was sitting on your porch eating some fresh salsa, looking at your lovely gardens. My garden has produced very little this year. some years are better than others. Oh, my goodness!! Need some homemade flour tortillas to go with those and you'd be set for a feast. Looks wonderful. What a lovely snack and all from your garden! Great! I've got a bag of windfall apples and pears to do something with at the moment. Thank you for the recipe, Candace! 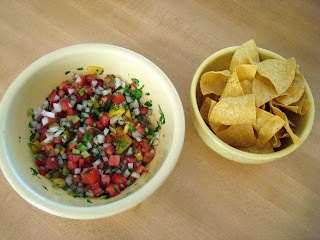 Your garden veggies must taste amazing in this salsa. Very fresh and very tasty! Looks like the start to a party! Yum! 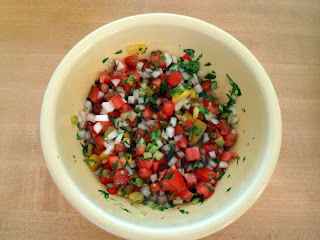 I love fresh salsa! Yummy!! I can smell it from here!! Looks so good. Too bad I'm the only one in my home that loves cilantro. I can eat it by itself! I would love your recipe for sweet zucchini relish-thanks for sharing. I am really enjoying your trip pictures. We went to Lake Louise in Baniff last year and would love to go back again.